Celeste Fulwood Bowen, 78, of Tifton passed away Friday, January 26, 2018, at Cypress Pond Assisted Living in Tifton. Her funeral service will be held at 2:00 p.m. Monday, January 29, 2018, in the Memorial Chapel of Tifton’s First Baptist Church with Dr. Wayne Roe officiating. Mrs. Bowen will be laid to rest at Oak Ridge Cemetery. The family will receive friends Monday, January 29, 2018, from 1:00 p.m. until the hour of the service at the Memorial Chapel of Tifton’s First Baptist Church. Bowen Thornton, Robert Hill, David Hill, Dudley Click and Josh Hendrix will serve as pallbearers. Born January 16, 1940 in Tift County, Mrs. Bowen was the daughter of the late Paul Fulwood, Jr. and Margaret Harrell Fulwood. She was also preceded in death by her husband, William Bowen, Sr., who she married in 1958; and a sister, Carolyn Hill. 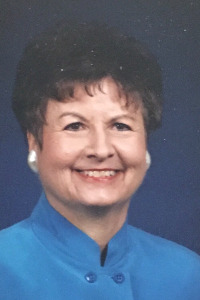 She was a member of Tifton’s First Baptist Church, where she served as Director of the 11th and 12th grade Sunday School Department for 15 years and was former director of the Senior Adult “One Day Club”. She served on the Senior Citizen Committee of the Mell Baptist Association and spent many years helping the youth in Tift County. In 1989, she received the Exchange Club’s Golden Deeds Award. Mrs. Bowen is survived by one son and daughter-in-law, William and Kelly Bowen of Tifton; one daughter, Marlene Thornton of Ocala, Florida; one brother, Paul Fulwood, III of Tifton; five grandchildren, Melissa Harper, Bowen Thornton, Sara Katherine Bowen, Megan Bowen and Anna Bowen; and three great-grandchildren, Kyler, Cody and Kasen Harper. The family would like to express their sincere appreciation to the staff at the Season Suites at Cypress Pond for their loving care of Mrs. Bowen. Flowers will be accepted or memorial gifts may be made to the First Baptist Church of Tifton Memorial Fund, 404 Love Avenue, Tifton, GA 31794.